In late 2008, A2Ethics was a start-up working out of a cramped space in an Ann Arbor home, and NOT-- as most start-up stories have it -- in a garage. Across town, a group of visionary Michigan undergraduates were hard at work forming the University of Michigan Ethics Bowl Team. Since our start-up stories, we have both strived and survived, helped considerably by the wisdom and largesse of individuals—and of crowds as well. At A2Ethics, we knew from our initial podcast with members of the 2013 U-M Ethics Bowl Team, that this was an organization worth more than just the moral backing. In turn, the U-M Team has supported us: as knowledgeable judges in the expanding Michigan High School Ethics Bowl and as exuberant and amiable team members in our signature event: the annual Big Ethical Question Slam. As ethics entrepreneurs, we have both become an integral part of the Michigan ethics venture scene. While A2Ethics is developing a new kind of civic involvement through its unique community events, the U-M Ethics Bowl Team has been creating a new student organization and serving as the new face of Ethics Bowl competitions. And now the U-M Ethics Bowl Team and A2Ethics have teamed up to launch a first-ever joint venture. Present the first Case Writing Competition for U-M undergraduates that highlights both the Ethics Bowl enterprise and our joint venture. The competitive events are what we like to call Bowl Day. 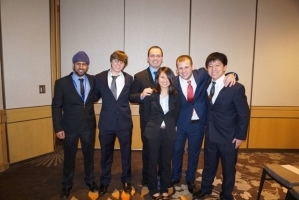 During these all-day judged tournaments, student teams from various schools pair off to present their best responses and reasoned arguments to several ethically entangled scenarios known as the Case Studies. Their listeners include three judges, other teams and interested supporters. Is Ethics Bowl a Sport? The object of Ethics Bowl is for the players (i.e., the student teams) to train. They do this by learning the philosophical fundamentals and reasoning skills necessary to discuss a set of challenging ethical Case Studies, in front of and along with three expert judges, a similarly trained opposing team of players and Bowl supporters who--like diving fans--are free to breathe and clap after a given round. If we were to wax philosophical about the Ethics Bowl, we would argue that it is both a judged performance and a refereed game. As in snowboarding and gymnastics, performances include form or an aesthetic component. Likewise, as in the games of basketball and hockey, adherence to procedures or the rules is essential. And Finally. How you play the Bowl DOES Matter. It is an Ethics Bowl. Without Case Studies, there would be no Bowl. So what exactly are they? What distinguishes the Case Studies in Ethics Bowl is their real worldliness and the diversity of professions and occupations from which they are drawn. These typically range from medicine and education to business and the military. Topics are equally eclectic, touching on everything from personal relationships to current social and political problems with ethical dimensions. With Case Studies, there are always favorites--memorable scenarios that individual team members think are the best. When we asked current co-chair of the U-M Team, Cullen O’Keefe, which Case Study he thought most compelling, he did'nt hesitate to name “Unrestrooms,” a case about school/locker room bathroom use involving transgender students. It was a case that we found compelling too—so we invited Cullen to do a podcast about the arguments he and his teammates prepared from last year's Bowl competition. Given the security problems in failed states and war zones, is it ethical to pay looters as a way of securing precious cultural artifacts? Is it best to focus energy and resources on saving species with a good chance of survival rather than those with only a small chance of staging a comeback? Considering the potentially high healthcare costs of treating childhood diseases such as measles, should society impose a tax on parents who refuse to vaccinate their children? Is the composting of human corpses disrespectful to the dead, or an ecologically sound way of honoring loved ones that reflects the cycles of nature? 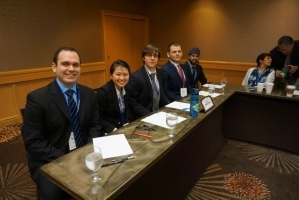 For all the Case Studies and details: 2015 Regional Bowl Case Studies set. 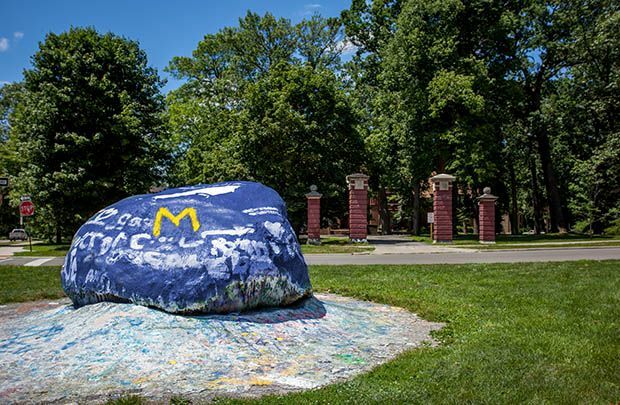 We could paint the U-M Rock to promote the team. But that would be temporary. Besides, we have more to tell about each team member as an individual than we have paint for the U-M Rock. U-M Senior Cullen O’Keefe, who co-chairs the Ethics Bowl at Michigan, is majoring in both Philosophy and Ecology & Evolutionary Biology (EEB) with a minor in Gender & Health. Originally from nearby Birmingham, Michigan, Cullen joined Ethics Bowl during his sophomore year after learning about it from an interview posted by A2Ethics with then-co-chairs Tracey Fu and Hasenin Al-Khersan. Since then, Ethics Bowl has been a central part of his college experience. Cullen's ethical interests include bioethics, social justice, action theory, and political philosophy. He works as a resident advisor in West Quadrangle with the Michigan Community Scholars Program (MCSP), a social justice living-learning community. In addition, he volunteers with the Sexual Assault Prevention and Awareness Center (SAPAC) and supports TransForm (a transgender rights group affiliated with the Spectrum Center). Cullen has studied at The Hastings Center and worked for the National Center for Transgender Equality. For fun, he likes to read, run, watch TV, listen to podcasts and write. Ethics Bowl co-chair Amanvir Mandair, a junior from Dexter, Michigan, is double-majoring in pre-med and Bioethics. Aman joined the Ethics Bowl in his sophomore year after discovering it on Maize Pages and speaking with then-chair Patrick Baumhart. His ethical interests include bioethics, race and ethnic relations, religious ethics, war ethics, ethics relating to technology, and history. Outside of Ethics Bowl, he volunteers at the U-M hospital and works as a tutor at the Sweetland Center for Writing. He is also a volunteer for Grace Care Center, an orphanage and elder care facility in Sri Lanka where he tutors orphans in English via Skype. He enjoys reading, using Netflix, weightlifting, and playing the dilruba (an Indian string instrument). Isabel Geracioti, now in her senior year, is majoring in Philosophy and minoring in Computer Science. A native of Nashville, Tennessee, Isabel is new to Ethics Bowl this year and has a particular interest in gender equality and artificial intelligence. She is also a member of the University of Michigan's Ice Carving Team and works two jobs in Ann Arbor—one at the U-M Alumni Center and one as a writer for Ann Arbor Holistic Health. She spends her free time coding, playing guitar and writing non-fiction. Joseph Shim, a senior from South Korea, transferred to U-M from Michigan State University during his junior year and recently changed his major to Economics, with a minor in Philosophy. Motivated by his interest in political philosophy and moral philosophy, Joseph looks forward to participating in his first Ethics Bowl during the 2015-2016 academic year. As he notes, “Although I don’t have much experience in the field, I enjoy thinking about issues related to philosophy.” His non-academic pursuits include listening to music, watching movies and working out. It was a freshman-year course entitled Moral Problems and Principles that led Kate Leary to her current major in Philosophy. Within the field of bioethics, her main ethical focus, she is particularly interested in patient autonomy within the patient-physician relationship facilitated by full and honest disclosure from both sides. Kate also has an abiding interest in political philosophy. In addition to her studies in philosophy, she has taken numerous courses in physics, biology and chemistry in hopes of attending medical school after graduation. Kate’s long-term goal is to incorporate her love of ethics into her life’s work as a physician. Outside of the classroom, she works as a research assistant for an endocrine surgeon at UMHS, processing CT scans of Adrenal Cortical Carcinoma patients. You can also find her working as shift manager at Sweetwaters Coffee and Tea. In addition to volunteering at the Ronald McDonald House, she uses her free hours for reading, writing and spending time with family and friends. The U-M Team is currently training for the upcoming Regional Bowl, which will be held at Northern Illinois University on November 14, 2015. Who knows? At this very moment, they may be watching films, listening to motivational speakers, running up and down the Big House stairs in khakis, and doing ‘two-a-days’ in preparation for the Regional Bowl. All, of course, to secure a place in the National Intercollegiate Bowl in Reston, Virginia on February 21, 2016.
Who will the U-M stars face in their November 14th contest? Among their competitors are excellent teams from across the state as well as the region. That includes the Golden Grizzlies from Oakland University, who have also qualified for the Nationals in the past. And then there's another state team for the record books: the Western Michigan University Team, winners of the first ever Intercollegiate Bowl in 1995. Today, the Intercollegiate Ethics Bowl has grown to include hundreds of teams from colleges and schools across North America. The 2016 Bowl Day competitions will take place at 11 regional sites. Naturally, we think our own Michigan Team will emerge as The Leader and the Best. Go Blue! For more information on the U-M Bowl Team, you can go to the Maize Pages or the University of Michigan Student Organization Funding Commission of Central Student Government, the current sponsor of this year's team. The incredible growth of the Intercollegiate Ethics Bowl has generated enthusiasm and support for Bowl programs in high schools. After all, "brain sports" need developmental AAA leagues too. Right now, High School Bowls are being organized across the nation. We're happy to report that Michigan is in the vanguard. 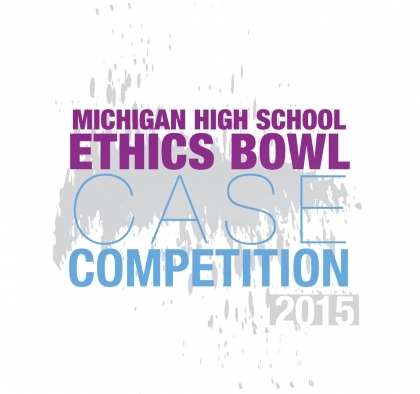 On February 7, 2016, 14 teams from around southeastern Michigan will assemble at the U-M Palmer Commons Conference Center for the Third Annual Michigan High School Ethics Bowl. The state champion will go on to join other regional winners at the National High School Bowl in Chapel Hill, North Carolina in April of 2016..
To raise awareness of the spreading number of Ethics Bowls in Michigan high schools--and to help our high school students learn the fundamentals of philosophical thinking--A2Ethics and the U-M Bowl Team are creating and co-sponsoring the first-ever case writing competition in support of the Michigan High School Ethics Bowl. Our Do The Write Thing case writing contest puts the spotlight on talented and philosophically-minded undergraduate students attending any campus of the University of Michigan. If you’re a currently enrolled U-M undergraduate at the Ann Arbor, Flint or Dearborn campus, we encourage you to enter the competition and try your hand at case writing. Once you DO it, you’ll see just how much fun it can be to create believable but baffling ethical scenarios that invite the best thinking of our next generation philosophers. In the process, you could win one of two cash prizes! Click here for details on the 2015 Do The Write Thing Case Writing Competition. If you enjoy pondering philosophical issues and discussing ethical quandaries with anyone and everyone, we also encourage you to consider joining the U-M Ethics Bowl Team: umethicsbowl@gmail.com. We think you would be Doing the Write and the Right Thing!